Arrow Season 7: Which Version of Roy Harper are We Getting? Home » TV » Arrow Season 7: Which Version of Roy Harper are We Getting? Earlier in the year Arrow had a bit of a send off for actress Willa Holland who was leaving the series. 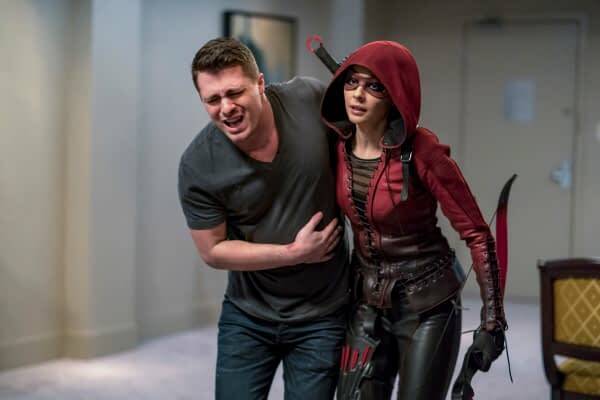 Her character of Thea Queen reunited with the man she loved, Roy Harper (Colton Haynes), teamed up with Nyssa al Ghul (Katrina Law) and headed off to find and destroy the three Lazarus pits that her father, Malcolm Merlyn (John Barrowman) had discovered. It was a nice little goodbye for some fan favorite characters without killing them off… in case they want to come back as a guest star. Arrow — “Doppelganger” — Image Number: ARR615b_0193.jpg — Pictured (L-R): Colton Haynes as Roy Harper and Willa Holland as Thea Queen/Speedy — Photo: Daniel Power/The CW — ÃÂ© 2018 The CW Network, LLC. All rights reserved. I can tell you it’s absolutely our Earth’s Roy. Colton is coming back as our one Roy Harper. We have a cool plan for Roy — now I should really get into the habit of saying the writers have a cool plan for Roy — but I think it’s premature to talk about that. I’ll let Beth [Schwartz] address that. Schwartz is the new showrunner starting with season seven, replacing Guggenheim and Wendy Mericle. Guggenheim is sticking around as a story consultant while Mericle has a development deal with ABC.